With the finish line less than a week away now as I write this, Fringe has entered into that danger zone where it starts to provide the answers to series’s long questions that the fans have been asking since the pilot. Inevitably the answers will split opinions. The task of providing answers to questions that feel organic and do not feel bolted on is a difficult tightrope act of writing. Especially given the nature of serialized TV where the goal is to prolong the journey as long as possible. Original intentions at the beginning of a continuing drama morph and change the longer the journey goes. Thankfully, in this episode Fringe has kept to its core themes while preserving the integrity of its continuity even while using one of the most dangerous writing devices – the retcon. Olivia Discovers The Price Of Freedom. Which ‘Boy’ is THE boy? Retconning comes in several flavors all of which share the concept of taking a previously established story point and repurposing it. The best retcons are those that are done with foresight. The writer knows where the story is going and so incorporates story points that the reader interprets one way initially. Once the retcon is revealed the reader can go back and revisit the initial story point and discover a new interpretation. The highest grade of retcon enhances the pre-existing story adding new layers of depth and meaning. The flip side is the retcon that is devised after the fact to kludge in a new use of a pre-existing story point. In TV this is the far more common type for the reasons mentioned above. It takes great skill to manuver a new story use into a pre-existing story line and make it seem seamless. The poorest cases of retconning are ones that break continuity or the ultimate failure – contradict what was previously established. Messing with continuity is dishonest story telling and invariably invalidates characters and their journeys. 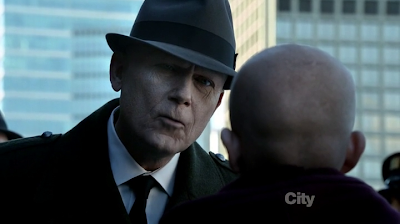 So it is with great pleasure to ‘observe’ over the run of the series that Fringe recognizes this and strives to be as honest in its story telling as much as possible. Its track record in the art of layering in new story points is exemplary because most of them have been set up with foresight. A few instances of fortuitous retconning, such as the purpose of Amber, that were not foreseen have been skillfully done to the point of where I would call it leveraging rather than repurposing. ‘The Boy Must Live’ – uses a piece of retconning with one of the most iconic lines for the series. ‘The boy must live. He is important,’ at the time of its first use, was clearly meant for Peter. In the third last episode we are now told that September aka Donald was referring to his own son – Michael – instead. Your mileage will vary with this new interpretation but for myself I found it added little value to Michael’s storyline and slightly detracted from Peter’s character arc. Fortunately this retcon does not invalidate or contradict any previously storylines so in the end this new storypoint ends up being a wash for me. The acid test will be on rewatches. When September says the line for the first time in Season Two, will we think Peter or Michael? Or both? My current feeling is that I still will believe September is referring to Peter. Maybe in time, I will think of both of them. I doubt though, that I will ever just think of Michael. Others have stated they like this new slant on the ‘Boy’ line because it emphasizes how much impact the relationship between Walter and Peter affected September and compelled him to hide his son in the past. Whatever your reaction was to the new use of the ‘Boy’ line, this is an excellent reveal because it deepens the original Season One episode. This parallel was already apparent to me which is why I am ambivalent on the change of meaning with the ‘Boy’ line. Walter tells Peter he has never loved him more than he ever has now – sweet and foreshadowing? Plan offers the chance of getting Etta back. Or will it? What else could be lost? The boy is important – is apparently Michael. For me, it’s still Peter. White Tulip appeared in this timeline too, thanks to September. Windmark’s chilling, ‘Hello,’ to Michael. The episode kicked off with a nice callback to earlier times. We got Walter going into the tank, au naturel, and poor Olivia being the unfortunate spectator to Walter’s ‘sport.’ Also a call back. With Donald’s location ascertained, a very upbeat Walter charged off to find him. What followed was a wonderful scene between Walter and Peter as John Noble gets to play another version of Walter – this one a nearly fully healed one. John Noble was stellar and both actors played it well with their moment ending in an fierce hug and then leavened by the usual humorous Walter inappropriate line about public restrooms. Beyond the link of giving Walter the information to find Donald, Michael also imparted unto Walter memories from the other timeline as well as a solidly seated sense of humility. Something that Walter has not had ever. Given the reveal later in the episode that Walter has agreed to sacrifrice himself so the plan may succeed, the gifts Michael has given Walter have him the best prepared he has ever been in terms of his emotional and mental faculties. What form this sacrifice may take will be revealed in the finale. The implication is that Walter must die but I really like a scenario a podcast friend of mine, Jesse Jackson – no not that one, came up with during our Fringe Benefits Inc podcast review. In order for the plan to succeed, Walter could well have volunteered himself to go with Michael to 2167 and act as his guardian as well as ensure the future scientists understand the importance of Michael. 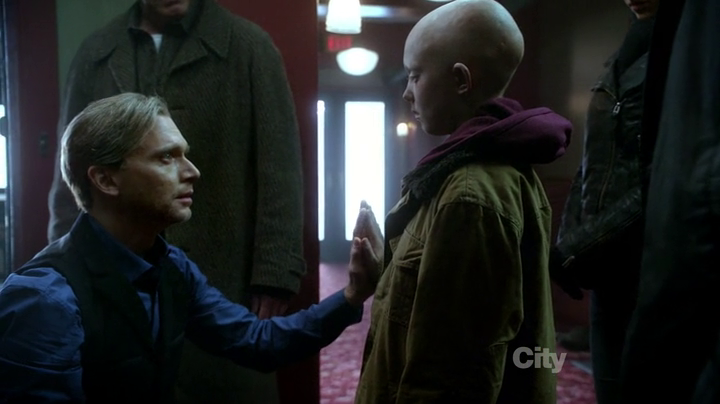 There is a wonderful symmetry there that would happen if Walter could undo all the damage he did as well as be a father in the future. The real concern going into the finale is what the impact of any reset will be. Fringe, for me, has always been a story of journey and not destination. If the characters end up in a good place but do not remember the five years we have shared with them, that would be disappointing. Just like Peter, Olivia and now Walter carry memories of both timelines; I hope for something of the same when the last few moments of Fringe play on Friday, January 18, 2013. I may be saying Hello but I really mean Boo! If only the original line had been, ‘ The boys must live. They are important.’ That would have kept us guessing until now. Like any fan celebrated show expectations are created and either met,diappointed or rarely exceeded. What’s most telling is how well you enjoyed the experience along the way. I couldn’t have enjoyed my time with Fringe more. That I am fortunate enough to watch the finale with fans from this podcast is icing on the cake. Have a blast at the Fringe Finale party! !